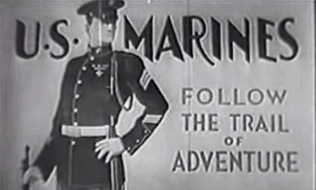 The Fighting Marines (1935) is a Mascot movie serial. It was the last serial ever produced by Mascot. The studio was bought out and merged with others to become Republic Pictures. This new company went on to become the most famous of the serial producing studios, starting with Darkest Africa in 1936. Future Republic Producer Franklin Adreon first became involved with serials with this production. The former regular Marine then a Marine Corps Reserve officer was a technical consultant and played the small role of Captain Holmes in the later chapters. When the United States Marine Corps starts building a landing strip on Halfway Island in the Pacific Ocean, they interfere with the secret hideout of the masked mystery villain, The Tiger Shark, who begins to sabotage their efforts. Sergeant Schiller is abducted by the villain after developing a gyrocompass that could pinpoint his location. Corporal Lawrence and Sergeant McGowan attempt to rescue him and stop the Tiger Shark for good.